A chance conversation at a BBQ joint about the environmental effects of our food choices left the author struggling to come up with a simple way to explain it all, and more inclined to order the salad next time. Recently I had lunch with Clare Ellis, publisher of Stone Pier Press. We’re cousins and I was in San Francisco for a family event. Someone - not Clare - had chosen a BBQ joint for lunch and while we looking over the menu I asked what she was up to. Clare started telling me about Stone Pier Press and its mission, which is to help people see the power our food choices have to help or hurt the planet. Clare finally ordered a salad, the only meatless item on the menu. I - awkwardly, given the conversation that followed - ordered the pulled pork. I had yet to discover she is publishing a book about a rescue pig. And I asked her to elaborate. Twenty minutes later I was grappling with trying to make sense of the sheer number of factors she described when it comes to food and our health and planetary well-being. There’s a really strong connection between the large scale production of animal products, such as meat and dairy, and global warming. Animal agriculture is a leading cause of air and water pollution, the decimation of grasslands and forest, and species extinction. It also uses up lots and lots of freshwater. I'm glad I didn't order the burger - a pound of beef costs about 2,000 gallons of water to produce. Animal products are pumped up with antibiotics and hormones and eating meat is tied to a higher incidence of health issues, like heart disease, cancer, Type 2 diabetes, and stroke. The conventional way we grow our food erodes our soil, releases CO2 into the air, and requires lots of water. It also depends on tons of pesticides and chemical fertilizers. We dump about a third of our food into landfills every year, which throws off a lot of warming methane gases. Globally, if food waste could be represented as a country it'd be the third biggest emitter of methane behind China and the US. Finally, as someone who spoils my two dogs more than most children are, I was alarmed to hear how badly factory farmed animals are treated. This was more than I’d bargained for when I asked Clare for an update on what she is working on. It was interesting, and although I’d heard of most of the issues individually, what was new was trying to think about all the issues together. It was a bit overwhelming. I returned to the East Coast and caught my wife up on the various conversations I’d had during my trip, including the Food Talk. We realized that without a framework of sorts the issues can get muddled and even lost. So we worked out how we would approach the topic. Having grown up in the world of financial analysis where conveying lots of information efficiently is part of the job, we decided that a visual tool could help convey the concepts that Clare had shared pretty well. And that maybe by doing so it could be a means for people to track how to change their diet for the better. What we came up with was a heat map. 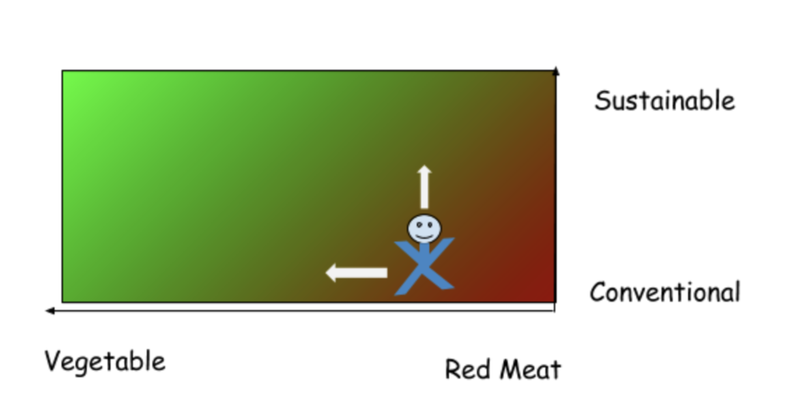 It’s highly simplified but works like this: People can figure out where they are in the continuum of food choices and figure out the steps necessary to move to the left, towards less red meat and more plant-based foods, and up, from wasteful conventional agricultural practices to better, more regenerative ones. Would that I could further develop this. I’m sharing it in case a visual makes it easier for you to make a few simple changes yourself. It helps me realize, for instance, that I don’t have to give up pulled pork sandwiches entirely to make a difference but cutting back helps. And, yeah, now I kind of wish I’d ordered the salad. Andrew Canning had a long career in Wall Street and left after selling his investment consulting business to a leading global advisory company. Currently he splits his time between New York and South Carolina.